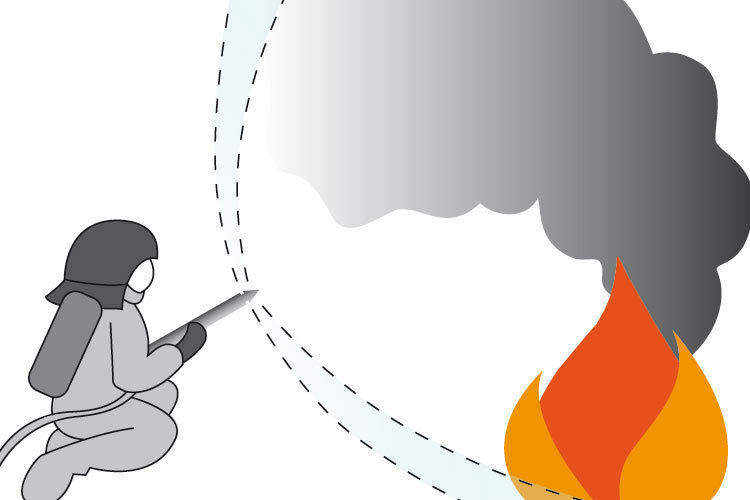 Basically there are two different fire-fighting strategies possible when using the Fognail®. We differ in direct and indirect attack. 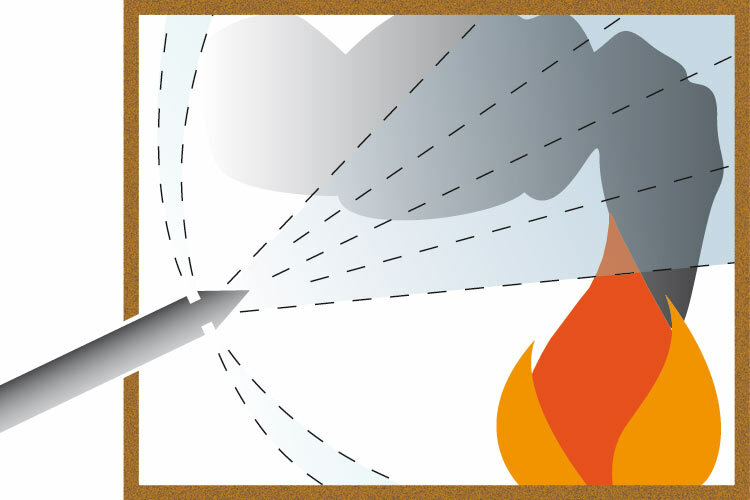 Direct Attack means pointing with the Fognail® direct towards the flame. That is useful in case of an open class A fire. 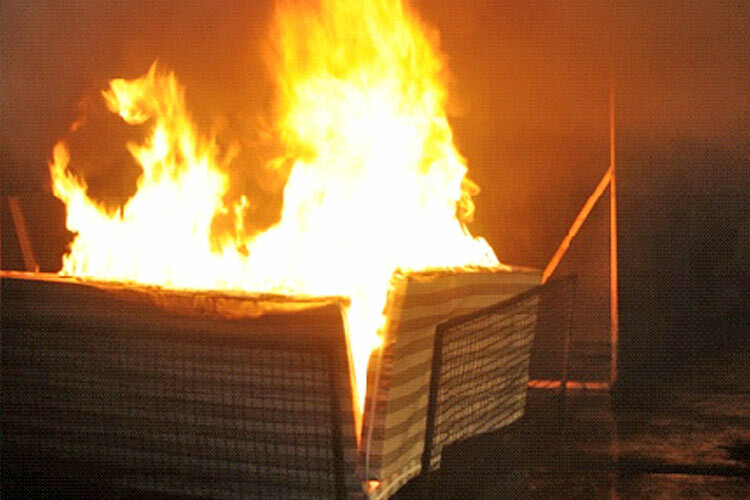 The Fognail® is also used as a hydro-shield by fire-fighters in high-temperature areas. The indirect attack is where the Fognail® was developed for. With this technology, it is possible to stabilize a danger situation very quickly. 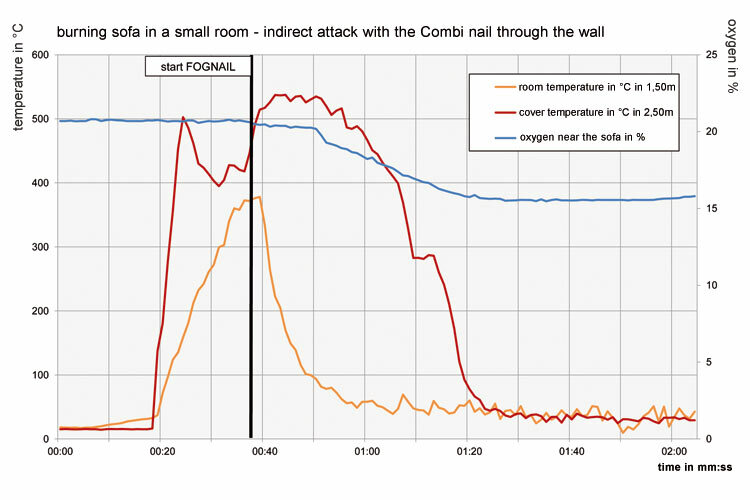 The Fognail® enable the user to punch the containment (wall or door) of the fire affected area without opening the containment with the risk of oxygen inrush or flame spread out. The extinguishing or minimizing of the fire is possible within seconds with that technology, combined with a most possible saving of the fire-man staff because he is not directly exposed to the harmful effects of the fire, such as heat, toxicity and visual obstruction. 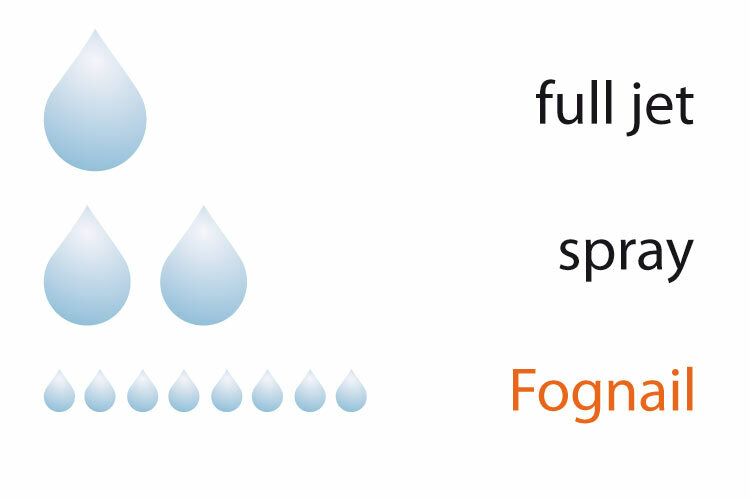 The Fognail® fights fires with small droplets of pure water. The water will be atomized while passing the special, patented nozzles. The so generated water mist (Fog) creates indirect extinguishing effects as cooling and oxygen displacement. By atomizing the extinguishing water, many very small, finely dispersed distributed droplets formed in the spray cone create a large surface. Under using only 1 Liter of water a surface of 100 m2 will be created, which can absorb a lot of heat from the fire very quick while evaporate. This cooling effect not only results in a great deal of energy being withdrawn from the burning process, but the cooling of neighbouring surfaces is also achieved at the same time. This cooling reduces or prevents the formation of thermal pyrolysis gases. In addition, the finely dispersed droplets provide a shield against thermal radiation, meaning that material goods and people nearby are protected from the impact of the heat. Thermal barriers can be created in air ducts, pipes, conveyors and silos, which effectively prevent the spread of fire. A further extinguishing effect is local inertisation as a result of the production of water vapour. The small water droplets evaporate quickly in the flame zone and remove additional energy from the fire. 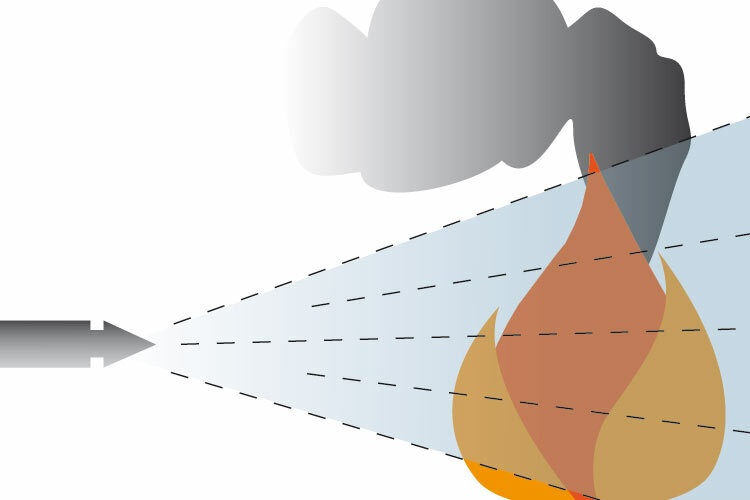 At the same time, there is local air/oxygen displacement and limited inertisation in the gas zone of the flames, which occurs as a result of the 1640-fold increase in the volume of the water caused by the vapour formation. Along with the high cooling effect, the ensuing water vapour either suddenly extinguishes the flames or it results in the formation of a thermal space pattern. 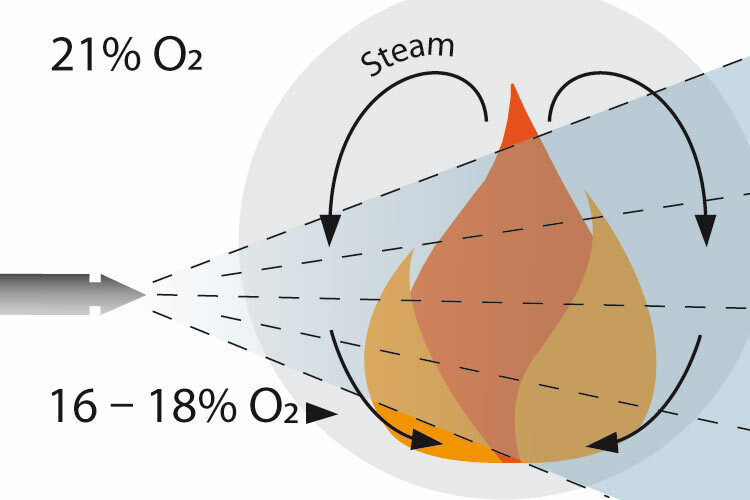 In the case of the latter, the ensuing water vapour is permanently further sucked in by the thermic of the fire, until there is an oxygen concentration of between 16 % and 18 % in the gas zone. Alongside the lasting cooling effect of the water mist, this leads to the extinction of the flames. In contrast to gas extinguishing systems, this phenomenon is limited to the area of the flames. Consequently, the inertisation does not necessarily have to occur in closed rooms and is exclusively limited to the area close to the flames. The formation of vapour in neighbouring areas, which under certain circumstances are also used as escape or fire-fighting areas, is excluded due to the significantly lower temperature in these areas. There is therefore no danger of the formation of superheated steam or insufficient oxygen concentration. Even when a high thermal load is no longer to be expected in the area surrounding that in which the Fognail® is being used, the protection of the fire-fighting crew and the necessary evacuation of the area must be ensured because of the development of toxic gases. Reignition of the flames is impeded or prevented due to the significant cooling effect. The use of water mist from Fognail® systems is 100 % environmentally friendly and is safe for humans. The inhalation of the ensuing water mist also does not pose any danger to or adverse effects for the fire-fighting crew or for people still present in the area of the fire. The threat of a dangerous eruption of steam is almost entirely excluded as a result of indirect use and the great cooling effect when used directly, even in small spaces. The use of our water lances is unique effective, as only a small amount of extinguishing water is required (between 40 and 60 litres per minute at a pressure of approx. 7 bar). The F500 multifunctional extinguish additive can increase effectiveness in the case of metal fires, glow fire and class B fires (0.1%-3%).